Photo by Saif Alnuweiri on Flickr. Last week Jim Richardson (Sumo/MuseumNext) and I hosted a 2-day workshop to help the Qatar Museum Authority (QMA) develop their digital engagement strategy. After two intense days of gamestorming, project design and requirement discussions I left Doha with the strong feeling we might have to look east if we want to discover what the museum of the future looks like. 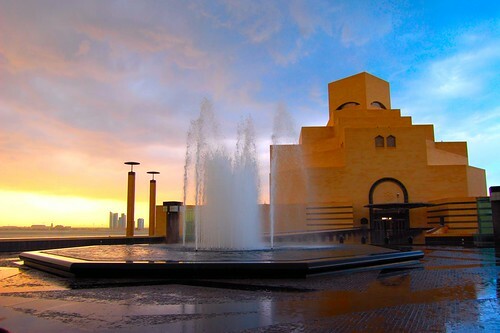 QMA’s vision is to be a global leader in the world of museums, art and heritage. Currently, they operate two museums and many others are planned. Their range spans from the existing mindblowing Museum of Islamic Art till a (planned) collection-less National Museum and an interactive Sports Museum. Their chairperson Sheikha Al Mayassa talks beautifully about the reasons behind such a strong focus on culture in a recent TED talk. Ambition. It’s not only their vision to become a global leader, within the team it is practice as well. Many ideas are bold, untried, an potentially very successful in finding new ways to reach and engage people with culture and the arts. Energy and optimism. Most people at QMA seem to work around the clock to excel in their work and make their bold ideas possible. There’s a strong can-do mentality. Cooperation with others. From their involvement in the Damien Hirst exhibition in Tate this summer to the companies they partner with to make their vision reality, QMA isn’t afraid to work together to make stuff happen. More than beautiful buildings. In reaching as much people as possible, QMA doesn’t limit itself to its (beautiful) buildings, but reaches out to where people are. They for instance have a stand in the Virigin Megastore, where many Qatari youngsters hang out. Of course there’s a sixth characteristic (money) that will certainly benefit them. However, I strongly feel this is not a key to their future success. Even in the absence of money the 5 characteristics above can create powerful cultural institutions. In fact, they might even be money-makers in the long run, which became apparent in some of the solutions to digital engagement we found in the workshop. Qatar might be a bit out of reach of your next study trip, but if you’re lucky with your tax returns or the national lottery I recommend you visit the small country and its great museums. Another option is to come to MuseumNext where some of their digital staff will attend (the weather is similarly nice in Barcelona). The last and cheapest option to keep an eye on them and their development is, of course, online. Looking back at the workshop we did, I’m pretty sure you’ll be hearing a lot from them in the digital realm!